LANGUAGE: Swahili is the national language. English is the official language. VISAS: A Visa is required for British passport holders and may be obtained on arrival at either Nairobi or Mombasa. VACCINATIONS: No compulsory vaccinations, however, Hepatitis A, Typhoid, Polio and Yellow Fever are recommended. Please consult your G.P. before travelling for latest recommendations. Yellow Fever vaccination is compulsory if crossing the border into Tanzania. A course of anti malaria pills are essential. Please consult your G.P. for advise as to the recommended ones for East Africa (currently Mefloquine OR a combination of Paludrine plus Chloroquine). Kenya is a country of striking contrasts and spectacular landscapes. Inland you may see snow-capped equatorial mountains; Kilimanjaro and Mount Kenya, or drive across the rolling savannah plains teeming with wild animals in their natural habitat. The temperature is constant and the rainy season is from April to June and from November to early December, although the rain tends to fall in short, heavy showers. Kenya’s Indian Ocean coastline boasts long white sandy beaches fringed with tropical palm trees protected from the open sea by a coral reef – the ideal place for a holiday to escape the cares of the world. 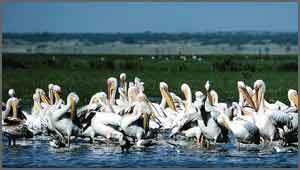 A Kenya safari offers you the opportunity to visit some of the famous National Parks and Wildlife Reserves to see not only big game animals but also some of the one thousand varieties of bird-life found in the country. Nairobi came into existence at the turn of the century as a supply depot on the newly built East African railway line. Gradually it has developed into the thriving city and important international business centre that it is today. The largest city in East Africa, with a diverse population of well over a million, it has modern high rise buildings and open tree-lined streets. There are a wide range of shops from modern malls to African markets, and plenty of bars and restaurants. A visit to the Nairobi National Park is recommended for an introduction to the wildlife species of East Africa. Other interesting trips from Nairobi include Giraffe Manor, the National Museum, Karen Blixen’s house, or a visit to Lake Nakuru. The Mombasa coastal area stretches along the Indian Ocean for 40 miles. The city of Mombasa is in fact an island, linked to the mainland by causeways, and the south coast of Mombasa is reached by the Likoni ferry. Long, white, sandy beaches stretch along most most of the coastline and some of the best are Diani in the south and Nyali in the north. The bustling city centre of Mombasa has a variety of shops and in the old harbour bazaar area it is still possible to see working dhows. The Shimba Hills Game Reserve is nearby and dhow safaris, glass-bottomed boats and a variety of water sports are all widely available. Malindi is an old Swahili settlement dating back to the 13th century and the old town has an Arabic flavour to it. There are sandy beaches to the north and south of the town, the best being Silversands to the south. The coral reefs of nearby Watamu Marine National Park offer superb diving and snorkelling. Many excursions are available including Gedi, an old Arab town deserted and left in ruins over five hundred years ago and now a National monument. Air excursions are available to the ancient Island of Lamu. Malindi is also noted as a centre for deep sea big game fishing. During the rainy season the sea beyond the reef can be rough and conditions may be unsuitable for Scuba diving or deep sea fishing. At certain periods, particularly June-July and November, the beaches may become covered by seaweed but most hotels clear their beachfront daily. Direct Charter flights to Mombasa are available from Gatwick and Manchester. The flying time from is approximately 10 hours. 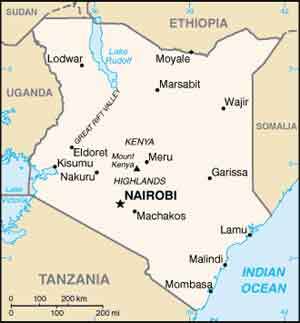 Flights to Nairobi are by scheduled airlines with a flying time of about 8½ hours. Scheduled are also available between Nairobi and Mombasa and these take about one hour. When flying to Mombasa via Nairobi a change of aircraft is made in Nairobi.